Adding to our running tally of totally geeky events, electronic musician Chachi Jones writes with a report from the Yuri’s Night party at NASA’s Ames Research Center. 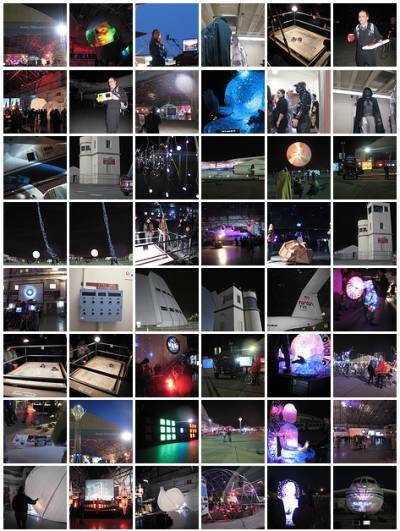 Sure, Yuri’s Night events, in honor of the great space explorer cosmonaut, take place all over the world. But when it hits Ames, you get a full-blown rave — and fantastic electronic music, to boot. Among others, Plaid and Telefon Tel Aviv made appearances. Chachi jumped into his flight suit with his circuit-bent Touch & Tell and Korg Kaoss Pad, which makes a nice mobile music setup. Also spotted: a toy keytar running through a ghetto blaster, our friend Steve Cooley’s space suit and jetpack, lots of space pr0n, and a spaced-out stage anyone would kill to play. If you’re looking to hold your own space party, see Create Digital Motion on 3D space video and photos of the sun. Why is Apple's Support for Java Multimedia So Poor?